Considering new siding? Consider this: Vinyl siding is a simple way to increase your home’s curb appeal. 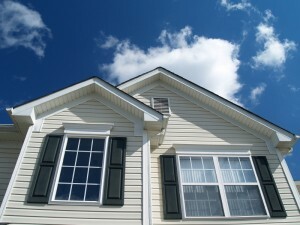 One of the more cost effective siding options, vinyl siding comes in an array of colors and styles. At Gerald Jones, we offer our siding expertise and professional installation services to help you beautify your home, whether you live in Raleigh, Durham, Apex or anywhere in between. Why Choose Vinyl Siding For Your Raleigh-Durham Home? Our Raleigh-Durham home remodelers will guide you through the entire siding replacement process, helping you choose the right style and providing expert vinyl siding installation. Trim, shutters and other architectural accents can also be matched to your new siding for a complete look. Choose from premium, high quality vinyl siding from the best brands. Whatever your home’s style, Gerald Jones has a vinyl siding option for you. From bright, vibrant colors to smooth, woodgrain and beaded textures, you can customize your new vinyl siding to enhance the look of your home. Interested in insulated vinyl siding? We do that too! Learn more about insulated siding installation from Gerald Jones. Proudly serving homeowners in Cary, Apex, Morrisville, Raleigh, North Raleigh, Chapel Hill, Durham, Hillsborough, Mebane, Roxboro, and Creedmoor for three generations, Gerald Jones Company is your best source for new vinyl siding! Come visit our state-of-the-art showroom in Durham, NC to see our quality products, or contact us for an appointment today!